Helping evil bunny rabbits and sick children. Worth more than a penny! 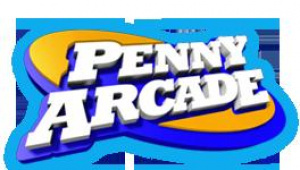 The gaming webcomic Penny Arcade, have leant their efforts to help show off Rayman Raving Rabbids in a new ad campaign. The game was released at launch but Ubisoft have asked Gabe over at the PA blog to design some short comics in order to give the game an extra kick in the media stakes. 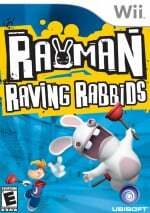 If you've played Raving Rabbids then you're familiar with the crazy bunnies and the sorts of things they do and don't like to do. See all the mini games have funny names like "Bunnies don't like being disturbed on vacation" or "Bunnies are addicted to carrot juice". We thought these names were great and so when Ubi asked us to do something for Raving Rabbids we decided to make up a few of our own and then illustrate them as one panel comics. Thanks to Joe Pekar who coloured these for me. He did a great job as usual. You can see our finished products over on the Rayman site. In fact, you need not venture over the official site; they are below in all their glory. Now is the perfect chance to alert or remind everyone of the Childs Play charity. Basically the same guys at Penny Arcade set up a charity a few years ago that asked gamers (and everyone else) to donate to the charity, which in turn gives video games and toys to sick children in hospitals over America, Canada, Australia, England and Egypt. If you wish to support the cause head over to the official Childs Play Charity website for information on how to give a gift to a sick child. You can even pick the gift from an Amazon wish list yourself.